We’re Peter & Sue Maier and we’re thrilled to be your Bin There Dump That Omaha franchise Location. We moved to Omaha, NE in 2011 with our two children, John and Jennifer. Peter is from Milwaukee and Sue is from Chicago, where we previously lived. The minute we arrived in Omaha we fell in love with the city. It’s a hidden gem that boasts fantastic restaurants and shopping, a vibrant performing arts scene and the good midwestern values that we’re accustomed to. The city’s entreprenurial spirit caught us and we’re blending our backgrounds in sales, marketing and public relations to bring to you the most efficient, friendly and high-quality disposal services in the area. When not taking our rescue dog, Jake, for walks and cheering on the Nebraska Huskers (Go Big Red! ), we like to debate over who has the more worthy football team -- Peter’s beloved Green Bay Packers or Sue’s revered Chicago Bears. When choosing Bin There Dump That dumpster rentals in Omaha, you will receive professional, friendly and prompt service. All of our trucks and dumpsters are residential friendly and can fit in narrow driveways and tight locations. To help you better, our Dumpster Consultants will take the time to know the details of your project to ensure the highest level of customer service. 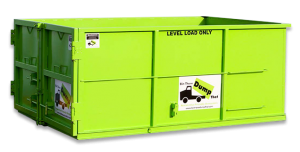 Bin There Dump That Omaha has a flexible delivery and pick up schedule that works best for you. All dumpsters in Omaha are delivered clean, well maintained and easy to operate. We developed a unique method of delivering your dumpster by placing wood boards under the green dumpster so that it never touches your property, eliminating the opportunity for any damage to occur. Our Dumpster Consultants make ordering a dumpster rental a simple and easy process while our professional uniformed Dumpster Delivery Experts will perform a quick sweep of your dumpster rental area after your job is complete. This is just another way Bin There Dump That in Omaha cares about our customers and their property.